Very appropriate for today! We've been clearing a couple of inches of snow which wasn't due until later today, and we're still on for more. So nice warm drinks are definitely in order. 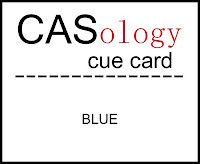 The cue word at CASology is blue. The challenge at One Layer Wednesday, hosted this week by Heather, is Keep Warm. Just check out that jumper card she made - and I bet she knits as well! The challenge at CAS-ual Fridays is to make a tall/long card. 3 x 6, 4 x 8, etc. No standard A2s for this week. The image stamp is another of my sale bargains (75p), from Inkadinkado, and the sentiment is from Paper Smooches Sentiment Sampler. Oh boy but I love this card! Long and lean and a beautiful blue cup of something yummy! Thanks for joining in on the fun at CASology this week! Love the height - lots of room for the steam to rise! Thanks so much for playing along with us at CASology this week, Shirley! What a great card shape and size. I really like the positioning and colour of your warm and welcoming cuppa. And yes, I do knit. The funny thing is I finished that little jumper image on my card and realised that I had unintentionally stamped it in the colour of the jumper I just completed for myself. once, again, you have created an absolutely fabulous card, shirley! thanks so much for playing along with CASology each week! Shirley, sure sounds like you need something nice and warm about now! I love the steamy cuppa paired with that sweet PS sentiment...perfect in blue, too! Thanks for playing along at CASology this week! What a cool card, love the design in the center. Thanks too for playing at CAS-ual Fridays!